The Road Home is a short film about belonging. The Frau was looking for a short film to watch during Baby M’s nap last week when what should appear in her inbox but an e-mail from the director of the Academy Award shortlisted film, The Road Home, inviting her to watch his film for free. Since nothing is ever free in Switzerland, The Frau does not say no to free—especially something free that interests her. The film, The Road Home, specifically deals with expat themes—mainly with the topic of third culture kids. Now that The Frau is a mother of a toddler who says no in two languages, it’s a subject that interests (and worries) her. Third culture kids (kids who grow up outside of their parents’ culture) often struggle with a sense of belonging. 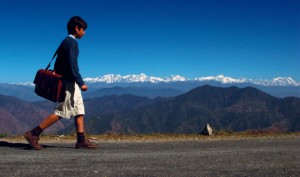 In The Road Home, a young boy who looks Indian but is British, struggles with identity while at a boarding school in India. Thanks to the generosity of director Rahul Gandotra (himself a third culture kid), The Frau is able to invite all yodelers to also watch The Road Home for free. If you’re a parent abroad, do you struggle with the idea of raising a third culture kid? Or did you grow up as one? If so, how was your experience? Thank you for sharing this. What a wonderful film. "God has written this into your destiny" how powerful! I guess it is nice to see a free movie. The film is interesting because it seems important to know the sense of belongingness. I could not relate to third culture kids but I know that it seems awkward to deal a belongingness struggle. Maybe I should check if this film is available online. Hmm, maybe I will need to check this movie out. In a nutshell, yes, this is common - perhaps not every kid, but many.